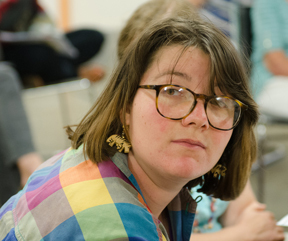 Allegra Stout recently graduated from Wesleyan University with a double-major in Psychology and Feminist, Gender, and Sexuality Studies, the latter with a concentration in Disability Studies. Hailing from Montville, New Jersey, Allegra has been active since a young age in feminist and disability communities. While at Wesleyan, she spent much of her energy organizing a disability rights group and campaigning for Disability Studies within the university, as well as volunteering in local schools. As a JOIN fellow, Allegra is thrilled to be working at the Boston Center for Independent Living, a disability advocacy and services organization, as an organizer focusing on healthcare issues. Ben Elkind is a recent graduate of the University of North Carolina, Chapel Hill, where he studied philosophy and cultural studies. 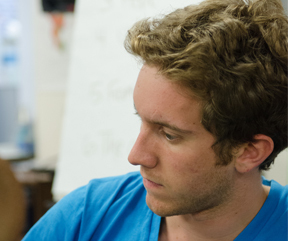 He is a proud alum of the Campus Y – UNC’s Center for Social Justice – and NC Hillel – UNC’s Center for Jewish Life. He was very active in Israel advocacy, serving on the national board of J Street U, and in cross-campus dialogue efforts during his time in college. He is thrilled to be spending this next year working for the Greater Boston Interfaith Organization. 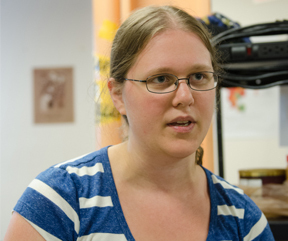 Bess Beller-Levesque is a recent Smith College graduate, who majored in Sociology. She was born and raised in Southern Maine and has done organizing work on environmental, women’s rights, and LGBT issues in Portland throughout the past few summers. Bess is excited to begin her placement with Toxics Action Center, where she will organize neighborhood groups to prevent and clean up toxic pollution threatening the health of their communities. 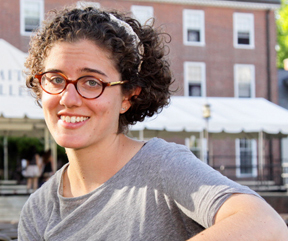 Davida Ginsberg graduated from Smith College in 2010 with a degree in Psychology and Spanish. During her time at Smith, she advocated for environmental sustainability on campus as a part of the Green Team. 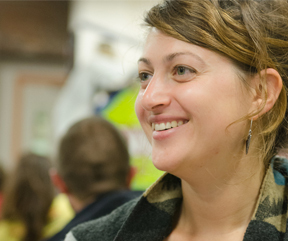 After graduating, she explored the intersection of farming and Jewish spirituality at Adamah: The Jewish Environmental Fellowship. Inspired to continue farming, she then spent a year as a work leader at Gould Farm, a residential therapeutic community for adults with mental illness in the Berkshires. 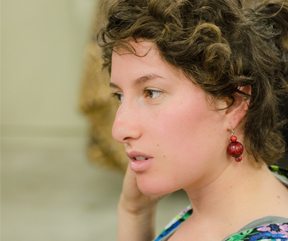 Davida recently moved to Boston and has become an active member of the Moishe Kavod Farm to Shul team, where she is a leader in food justice campaigns. As a JOIN fellow, she will be working as a self-advocacy organizer at Rosie’s Place, the first women’s shelter in the country. 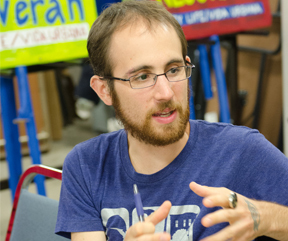 Elisha Baskin, born and raised in Jerusalem, is a scholar and activist focused on social justice and human rights specifically in Palestine. This past year she graduated from Brandeis University with a masters degree in Sustainable International Development and worked as a research associate at the Carr Center for Human Rights Policy the Harvard Kennedy School of Government. Elisha has worked as an activist and professional in the human rights field for several years with a variety of international and community based organizations including USAID, Amnesty International, Assaf-Aid for Refugees and Asylum Seekers, United for a Fair Economy, Bt’selem, Anarchists Against the Wall and Jewish Voice for Peace. As a JOIN fellow Baskin will work at SEIU Local 615 organizing service workers at Logan Airport. Emilia Diamant is a Boston native, triumphantly returning to her home state after nine years of wandering. First she wandered to New York City where she did her undergraduate degree in Urban Informal Education at NYU, then to Costa Rica where she worked at a boarding school as a Drama teacher, Dorm Supervisor, and College counselor. Finally she landed in Raleigh NC, where she briefly worked as a substance abuse and mental health counselor and then the past three years as Principal and Youth Director of Temple Beth Or, a mid-sized Reform synagogue. She received her Masters in Social Work focusing on Community Organizing and Non Profit Business Administration in May 2012. 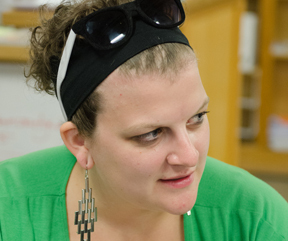 She will be working at Prozdor: The High School at Hebrew College as the Director of Programming and Initiatives, teaching organizing and helping assess communal needs. Erica Concors is a recent graduate of Smith College from southern New Jersey. 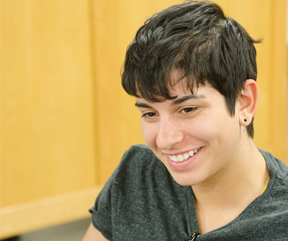 As a study of women and gender major, Erica concentrated her studies on women’s health. Although Erica spent 80% of her undergraduate career as a pre-med student, an internship at Cedars Sinai’s Women’s Cancer Program revealed to her a fundamental underlying issue within healthcare, namely health disparity. Ever since, Erica has been happily pursuing social justice work surrounding issues of health and gender. She is extremely excited about her placement at the Moishe Kavod House as a Resident Organizer. 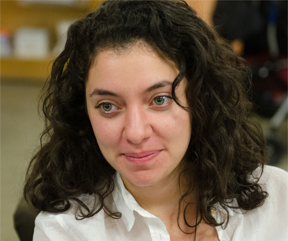 Francesca Contreras is a half Mexican-American, half Jewish British survivor, restaurant worker and labor organizer who recently graduated from Brown University where she studied Africana Studies and Latin American Studies. She was born in Mexico and has lived in Argentina, South Africa, Israel and finally Miami. As a student in Providence, she was co-founder of Brown Students for Justice in Palestine and off-campus worked as a computer tutor and immigrants rights organizer with the Olneyville Neighborhood Association in Rhode Island. She is incredibly passionate about and dedicated to her position as a Community Domestic Worker Organizer at “MataHari: Eye of the Day,” a women of color and immigrant women’s organization mobilizing for increased labor rights and dignity for migrant workers. Originally from Chicago, Jennie Msall has been living on the east coast since attending Vassar College in upstate New York. After graduating in 2010 with a degree in urban studies, she moved to Boston to work for The Food Project, where she has spent the past two years supporting teenagers and community members in growing food. Jennie is excited to be part of the JOIN community and to build organizing skills as the Family and Community Organizer at St. Stephen’s Youth Programs. Jeremy Wood grew up between the mountains and the ocean in Vancouver, British Columbia. He graduated in 2010 from the University of British Columbia with a BA in History and Classics with a focus on applying postcolonial theory to Jewish history. Over the course of his time in university, he organized on his campus and with low income communities in Vancouver’s Downtown Eastside in opposition to aggressive gentrification. Since then he has worked to teach models of coexistence to diverse youth in Ramle, Israel and has worked to support youth infected with and affected by HIV in Washington DC. He is new to Boston and excited to work this year at the Jewish Alliance for Law and Social Action, striving to serve as a Jewish voice on the left and a left voice in the Jewish community. Jessica Youseffi is a British expat residing in Los Angeles for the past 5 years. She graduated in the Fall of 2011 from the University of Southern California, where she studied Print and Digital Journalism and Communication Design. She was first introduced to the labor movement as an intern her Sophomore year with Clergy and Laity United for Economic Justice, working on the Hilton LAX boycott campaign. 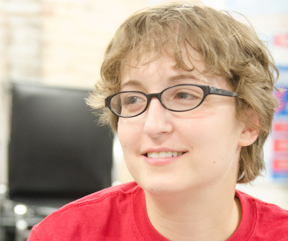 After graduating, Jessica became a full-time organizer with CLUE advocating for mass transit. Her coalition won the vote in support of the Westside Subway Extension, which will provide vital mass transit in traffic-riddled LA, and create thousands of jobs. Jessica also studied at the Pardes Institute of Jewish Studies in Jerusalem and Yeshivat Hadar in New York. She looks forward to her placement with Combined Jewish Philanthropy, where she’ll apply her organizing skills to engage young adults in Jewish education and community building. 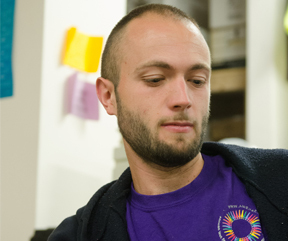 Joel Wool is a recent graduate of Emerson College, and an alumnus of Social Capital Inc.’s AmeriCorps program. As a JOIN fellow, he’s pleased to continue his work with Clean Water Action, where he advocates for equity in the growing green economy, expansion of renewable energy and a phase-out of dirty, toxic fossil fuels. Previous employment and coursework has taken him everywhere from writing to film editing to information technology to cultural criticism to global health to local organizing. Aside from work with Clean Water Action, Joel serves on the steering committee of the Dorchester Community Food Cooperative, collaborates with community leaders in both Boston and Haiti on a variety of health and environmental projects, and supports Massachusetts Service Alliance on a campaign to encourage volunteerism in the Commonwealth. He is a native of the Bay State. Kate Rafey is a native of Massachusetts and would surprise you with the many different locations she’s lived in across the state. She graduated from Clark University with a Masters in Public Administration, where she truly began to learn the meaning of social justice and organizing. Kate worked at Stonehill College as an AmeriCorps*VISTA in the Office of Community-Based Learning for two years through the Massachusetts Campus Compact. Last year, she was the Assistant Director of the UMass Hillel House, where she taught a course on Judaism & Social Justice. Her passions lie within ending the intersectionalities of oppression and she hopes to learn more about adding anti-violence work into this at her placement, A New Day–a sexual assault agency in Brockton where Kate is a former volunteer. 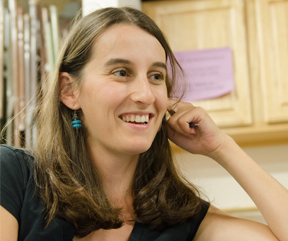 Lilly Jacobson graduated from UC Berkeley in 2011 with a BA in American Studies and City and Regional Planning. Her goal in life is to create urban social justice in American cities, which has lead her to work in both public sector City Planning and in the non-profit sector. She has spent the last year as the Community Planning Associate at the Fenway Community Development Corporation, and is excited to continue working there this year as a JOIN Fellow. She works with residents in the Fenway neighborhood to give them a voice in the development of their neighborhood and to help them advocate to the city and developers for affordable housing, community space, and jobs for local residents. Marjorie Corbman graduated in 2009 from the College of the Holy Cross in Worcester, MA with a degree in Religious Studies and a concentration in Asian Studies. Passionate about interfaith dialogue and religious diversity, she spent a semester abroad studying in Sri Lanka, where she chose to focus her independent study on the reconstruction of religious and social identity of the refugee Muslim community in Puttalam. After graduating, Marjorie spent a year and a half living and working at Su Casa Catholic Worker Community in Chicago, IL, a house of hospitality for homeless Latino families as well as a community dedicated to the principles of nonviolence, community, and radical social change. For the past year, she has lived in London, pursuing a Master’s degree in the Study of Religions from the School of Oriental and African Studies. She is excited beyond description to return to New England in time to see its beautiful autumn, and even more excited to start living and working with Moishe Kavod House in Brookline as a Resident Organizer. Sarah Resnick grew up in Pittsburgh. After high school she spent two years active in peace and social justice movements in Israel, including a year as a student at the Arava Institute. She moved to Toronto in 2008 to study forestry at the University of Toronto, where she became an active member of the food justice community. Her recent work experience includes managing a community garden, coordinating a local food box program, and working in education and grant-writing at a food bank. She is excited to be spending this year as a JOIN Fellow at the Committee of Interns and Residents in Boston.